Whether you’re buying film to install for customers or having film installed for you professionally, the window film warranty is one of the most important aspects to consider. This article will describe some of the most common warranty terms for window film and what to look for so you can get the best possible assurance. In addition, if you’re looking for high quality window film to install yourself, all products listed here have a window film warranty. 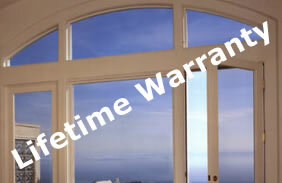 For standard solar films, you can usually expect a lifetime warranty on residential windows. This of course depends on the installation company, but any good one will offer this. Be leery of companies that do not offer one at all. They may be using low-quality film. Always ask about the warranty before starting any work. There may be stipulations based on the type of glass (single-pane or dual-pane) or the type of film installed (safety film, exterior film, opaque film). Because commercial windows are exposed to more wear and tear than residential ones, you should not be surprised if the warranty offered is less than lifetime. You can usually expect somewhere between 10-15 years for a high quality window film. Again, be sure to ask your installer about the warranty before beginning any work. As long as the installer is using high-quality window film, they should offer a lifetime warranty. Ask your installer first. Remember that a glass breakage warranty is different than a window film warranty. While companies will readily offer a warranty for the quality of their film and installation, they cannot always help you if the glass breaks. This may or may not be due to the film. Always ask your installer about the difference between glass breakage warranties and the film warranties. They should be willing to tell you if there is a high risk of breakage on your glass or if you do not need to worry about it. If there is a risk, they need to be sure and use an appropriate window film and possibly offer a glass breakage warranty.